The organization and patterning in the paintings are of my own design. I continue to explore in the paintings a metaphoric ability to address the human condition through pattern, structure and design, as well as for its possibility to trigger memory. The colors I use are personal: they reflect the collection of visions from my travels locally and globally. This is also one of the hardest aspects of my work as I try to derive the colors intuitively, hand-mixing and coordinating them along the way. In my process, I cannot make a color twice – it can only appear to be the same. This aspect is important to me as it highlights the specificity of differences that exist in the world of people and things. I want to expand upon painting to reinvestigate its inherent means, as well as contribute to its ongoing intellectual future. My commitment to painting has come with a growing understanding of quality and beauty that can be found through painting, and how beauty, when actualized, can communicate a complete consciousness. At this time, I am still interested in how my paintings can look like the scrambled reception from a television set, a disconnect from recognizable imagery, and yet giving one the sense of a familiarity located deep within one’s own culture. In our overly mediated reality, I am all too aware of television and its doctored way of transmitting the information we consume on a minute-by-minute basis – a type of socio/cultural information that can successfully influence us in the ways that we think, act, see and feel within our environment. It is my intent to mimic this format through painting, but in my way the subversion I wish to conduct is a type of communication that speaks of and for Africa. African culture is so interregnal to western culture, and yet the continent continues to exist as a region denigrated in the mind of the entire world. I wish to re-channel the negative thinking around Africa, speak from the center of its present-ness, and expand upon what I know and understand about the history of this amazing and unquantifiable place. 2010. Body & Space, Jack Shainman Gallery, New York, November 18–December 23, 2010. 2010. 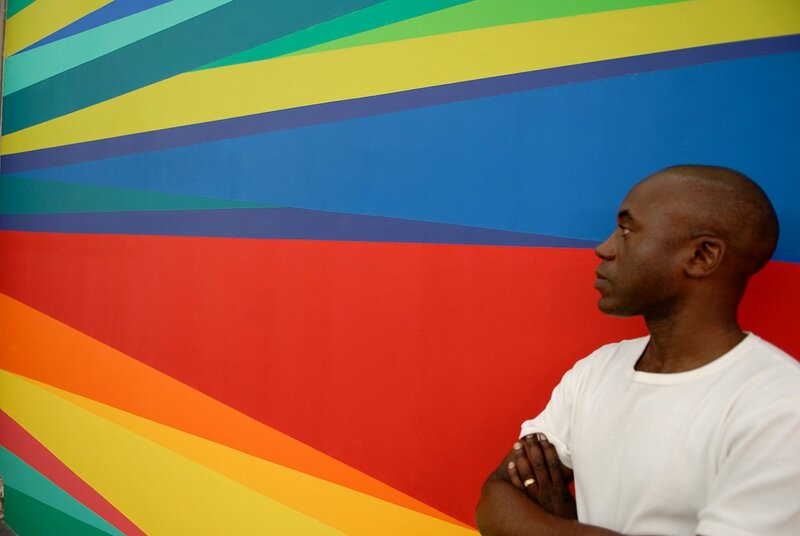 Perspectives 169: Odili Donald Odita, Contemporary Arts Museum, Houston, February 11–May 2, 2010. 2009. Up & Away (permanent installation),Butler Commons, Princeton University, Princeton, New Jersey, October 9, 2010. 2009. Television, Ulrich Project Series, Ulrich Museum of Art, Wichita, Kansas, April 9–April 26, 2010. 2001. Life, Riva Gallery and Florence Lynch Gallery, New York, October–November 2001. 2012. Magical Visions, University Museums, University of Delaware, Newark, February 8–June 30, 2012. 2011. Building The Contemporary Collection: Five Years of Acquisitions, Nasher Museum of Art, Duke University, Durham, North Carolina, March 10–August 14, 2011. Curated by Trevor Schoonmaker. 2011. 20 Years Thami Mnyele Foundation, CBK Zuidoost, Amersterdam, March 12–April 29, 2011. 2010. Wild is the Wind, Savannah College of Art & Design (SCAD), Georgia, January 8–February 28, 2010. Curated by Laurie Ann Farrell. 2006. -poiesis, Jack Shainman Gallery, New York, June 29–July 28, 2006. 2006–2003. Fiction of Authenticity: Contemporary Africa Abroad (travelling exhibition), Baffler Gallery, The Art Museum of the University of Houston, Texas, September–November 2006. Previously exhibited at: North Carolina Museum of Art, Raleigh; Regina Gouger Miller Gallery, Purnell Center for the Arts, Carnegie Mellon University, Pittsburg, August 20–October 3, 2004; The Contemporary Art Museum, St. Louis, September 20, 2003–January 3, 2004. Curated by Shannon Fitzgerald and Tumelo Mosaka. 2005. Surface Charge, Virginia Commonwealth University Museum, Richmond, September–December 4, 2005. 2004. Dak’Art 2004 – Dakar Biennale of Contemporary African Art, Senegal, May 2004. 2000. Kjbuh Kunstverein, Cologne, Germany, represented by Florence Lynch Gallery. 1999. Zeitwenden: Ausblick Ruckblick, Museum of Modern Art, Bonn, and Museum of Modern Art, Vienna. 1999. IN-VISIBLE: Abstractions & Narratives; Arsenal Gallery, Bialystok, Poland, September 10–October 17, 1999. 2004. The Thami Mnyele Foundation Grant for African Artists. 2001. The Joan Mitchell Foundation Grant for Painting and Sculpture. 2000. Nomination for Best Show of the Year by the International Association of Art Critics in New York. ArtsLink Collaborative Projects Award in Warsaw, Poland for exhibition, "Here & Now". 2011. The Role of Art in Diplomacy, National Gallery of Art, Washington, D.C.